- 콘센트에 꽂아 사용하는 공기 청정을 위한 제품 입니다. - 묵직하고 은은한 베르가뭇 향입니다. - 뚜껑을 돌려 따준 뒤 콘센트에 꽂아 주십시오. Inhale the energizing aroma of Italian bergamot oranges without being pestered by native fruit flies. Use Aura Cacia Uplifting Bargamot & Orange in your living room or workspace to create an uplifting environment. And breathe easier known that your true aromatherapy experience is naturally scented with pure essential oils. That's why we're dedicated to sustainable sourcing and business practices bringing you the purest essential oils offered by nature. Installation: Hold bottle upright and carefully unscrew the cap. Slide the bottle, wick-end up, into the unit and press until you hear it click in place. Keep bottle cap for future moving/storage. Operating Instructions: Plug unit upright into an outlet. For safe and effective operation, make sure to read and follow all of the important safety instructions. If using a GFCI Receptacle, test the "test"/"reset" button on a regular basis. Moving/Storage: Unit can be removed from the outlet and stored. Separate the bottle from the unit. Carefully screw the cap back on the bottle. Store in an upright position away from finished surfaces. User Maintenance: Essential oils may collect on the unit over time. Un-plug the unit and allow to cool before cleaning, wipe with a dry cloth. Do not immerse in water. Wash hands after handling. When bottle is empty, replace with Aura Cacia Electric Aromatherapy Air Freshener refills. Never try to refill or reuse an empty bottle. Only for use with Aura Cacia Electric Aromatherapy Air Freshener refills. 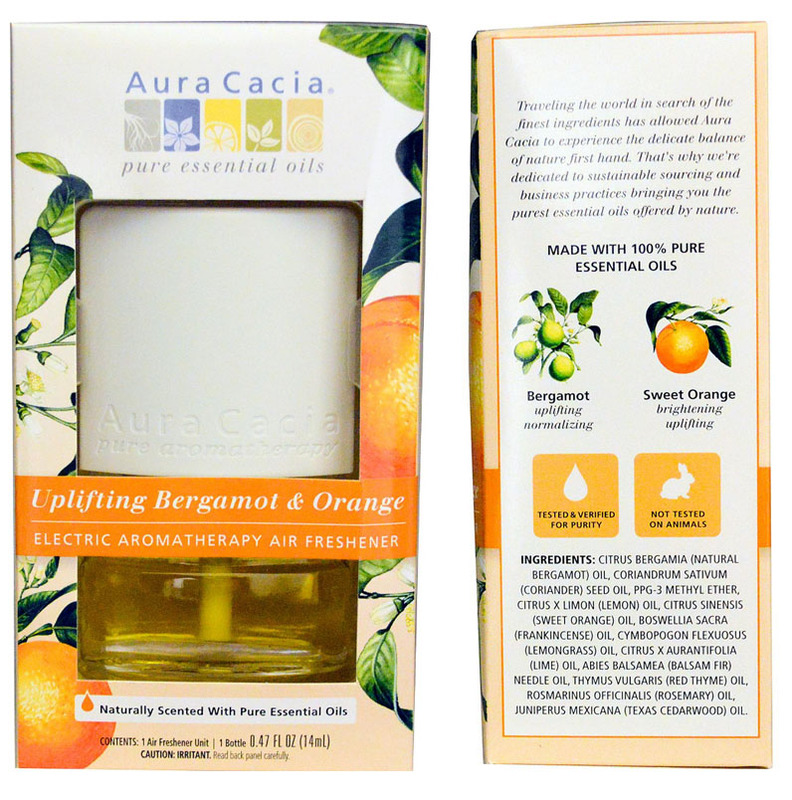 Use Aura Cacia Uplifting Bergamot & Orange in your living room or workspace to create an uplifting environment. Caution: Eye Irritant. If product gets into eyes rinse with water for 20 minutes. Consult a physician if irritation persists. If swallowed, do not induce vomiting call a physician or poison control center immediately. Keep out of reach of children and pets. Device intended for adult use only. Close supervision is necessary when product is used near children. Do not use in small or poorly ventilated areas. Avoid contact with skin and clothing. Always keep unit and bottles upright to avoid spills. Spills may damage finished surfaces. This device uses electricity, risk of fire and electrical shock. Basic safety precautions should always be followed. Do not place fingers or foreign objects into the unit. Use only in a properly functioning 120 volt outlet. Not for use in horizontal outlets. Do not plug in sideways or upside down, unit will leak. Never use with extension cords, multiples or three prong adapters. Do not plug in anything above the unit. Always allow a 12" clearance around the unit for proper airflow. Keep away from flammable materials. Avoid open flame. Do not use in damp areas. Discontinue use if unit is dropped or damaged.